As a small luxury glamping business, we depend upon on maximising occupancy and cancellations often result in empty rooms due to booking lead in times. If you wish to vary or cancel your Booking, please contact us immediately. For cancellations with 14 days or more notice the full amount paid will be refunded less a $75 administration fee using your original payment method. For cancellations within 14 days of your arrival all monies will be forfeited. Bookings for the Christmas and New Year holiday period require 30 days’ notice of cancellation or all monies will be forfeited. All cancellations must be received via email from the email address linked to the reservation. We strongly advise that you take out travel insurance to protect yourself against unexpected changes to your travel plans. A variation of the Booking which reduces the number of nights stay will be a treated as a cancellation of the Booking in respect of those nights. We have a minimum nights' stay policy of 2 nights. No refund will be made for a variation to the extent that it breaches our minimum nights’ stay policy. “Booking” means the period for which you have paid to stayat the Property. “Property” means Mile End Glamping accommodation and estateand all its fixtures, fittings and equipment. "Guests" means the persons who stay overnight inthe Property during the Booking. "Visitor" means a person visiting a Guest at theProperty during the Booking. Making a payment or being accommodated at the Property constitutes acceptance of these Terms and Conditions. Due to fire restrictions, Mile End Glamping is a NO SMOKING property. This includes the domes, driveways, pathways and any other areawithin the 144 acre estate. No camp fires, candles, lanterns or any other formof naked flames are permitted. Breach ofthis condition may result in immediate termination and eviction. If there is evidence of smoking inside thenan additional $300 fee will be charged to your credit card. Check-in time is not before 3 pm on the arrival date and check out time is not later than 10 am on departure date unless by prior arrangement with Management. Early arrival and/or late departure is subject to prior arrangement and availability and extra charges may apply.Complimentary parking is in the designated area adjacent to the domes. Guests can make their own way via a short bush path to the accommodation. In most cases, the door of the dome will be left unlocked and the key will be left inside. When checking out, guests are asked to leave the accommodation and BBQ clean and tidy with all trash placed in the rubbish bin provided under the dome. The key to the accommodation should be left on the hooks by the front door with the door closed. Payment in full must be received when the booking is made. Bookings are not confirmed until payment has been received. Payments of the amount due must be received in Australian dollars net of any bank or other transaction charges. Full payment is to be made within the specified time limits or the Booking will be cancelled automatically without notice. We accept payment by Visa and MasterCard. A credit card authorisation must be provided to Managementupon confirmation of your Booking. Any damage loss or expense incurred by Management as a result of your breach of these Terms & Conditions will becharged against the credit card. Examples include but are not limited to anybreakage, damage or excess cleaning requirements, extra Guests or Visitors beyond those declared. If the Property becomes unavailable for your occupancy dueto unforeseen circumstances (eg. fire, storm, damage, etc.) then Management will inform you immediately and any payments made will be refunded in full. Parties and Functions are strictly prohibited. The property may only be occupied by the number of people described on the booking. In order to respect the privacy and experience of all guests at Mile End Glamping, we request that no visitors be brought or invited to the property unless by prior arrangement with the management. Inthat instance, guests remain responsible for persons visiting. We request therebe no disturbance of neighbours, no undue noise, no behaviour likely to cause damage to property or offence or embarrassment to others, all noise to cease by 9 pm. Breach of this condition may result in immediate termination and eviction. Management reserve the right to revoke or refuse to honourany accommodation booking which may in the opinion of Management, (and at their sole discretion) be unsuitable for the property concerned. The same right to revoke or refuse a booking applies should details given of the guests prove to be inaccurate. We supply linen, pillows, blankets, robes and towels which mustbe left where supplied in the bedrooms or bath room on departure. Further linen may be hired through Management at additional cost. Beach towels are not included. Cleaning and linen change usually occurs weekly or more often upon request and at additional cost. A starter pack is provided consisting of tea, coffee and sugar. Washing up liquid, scourer, dish-washing cloth and some dish-washing tablets are also provided as well as two toilet rolls for each toilet. Please note these items are provided as a starter pack only for your convenience. If you run out you will need to replenish the items for the duration of your stay. 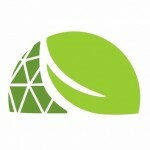 The Property Domes are fully self-contained and daily servicing is not provided. For stays of seven days or more, a complimentary midstay linen change is available. The Property Domes may be used to accommodate a maximum oftwo people in a king sized bed irrespective of age. All paddocks on the property are surrounded by electric fences and occasionally contain livestock. For your safety, please do not touch these fences, open any paddock gates or enter any paddocks. Some paddocks may appear empty but could contain bulls which can be aggressive. Any walking on the property must be kept to the driveways that you used to access the domes. Guests must comply with all applicable Mile End Glamping Rules and all instructions from Management and the caretakers of the Property concerning occupancy, property, health, safety and quiet enjoyment of the Property and our neighbours. Guests are responsible for damage, breakages, theft and lossof the Property and any part of it during their stay. You must notify us ofthis immediately. Management may recover from you repair or replacement cost (at Management's discretion). Only the guests nominated and agreed in the Booking may stay in the Property overnight. If any other guests stay extra charges may apply or the agreement may be terminated without refund. Disturbance to our neighbours, including excessive noise, is prohibited and may result in termination and eviction without refund and extra charges may be made for security and other expenses.Before departure, all food must be removed from fridges andall rubbish put in the appropriate rubbish bins provided under the dome. The Property must be left in a clean and tidy condition.Extra cleaning charges may be incurred for the cleaning of dirty dishes, BBQ, washing machine, dishwasher, emptying the fridge, removal ofexcessive rubbish etc. Should the cleaning fee be more than the usual cost forcleaning the property, you may be charged the additional costs over and abovethe normal cleaning fee which will be charged to your credit card.All furniture and furnishings must be left in the positionthey were in when you arrived.You are responsible for the safekeeping and replacement ofaccommodation keys. Duplicate keys will be provided at an additional charge of $25. Smoking is not permitted in the Property OR anywhere within the estate. In the case of any problem or complaint, you must inform Management at the earliest opportunity so Management has the chance to rectify the situation as quickly and efficiently as possible. You must allow repair/service access to the property during reasonable hours. Any complaint, which cannot be resolved during your stay, must be notified in writing to Management prior to departure from the Property. Failure to follow this procedure this may hinder the ability of Management to rectify the problem or complaint. We recommend all guests purchase travel insurance since Management are not responsible for anyinjuries, illness or accidents that may occur whilst staying at the property. Glamping - 'glamorous camping' - lets you go off grid, escape the stress of everyday life and soak up the wonderful Australian nature without sacrificing luxury and comfort. 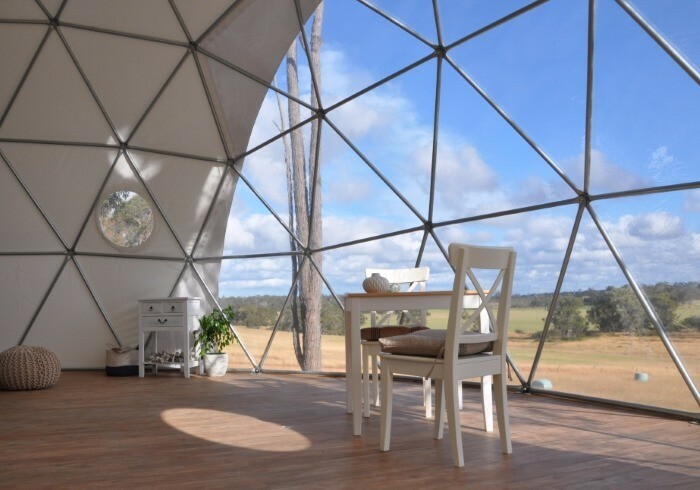 Perfectly designed for 2 people, guests at Mile End Glamping stay in luxurious light-filled geodesic domes including a private bathroom, kitchen, king bed, adjacent deck with private spa bath and BBQ and many more quality features. Set in idyllic surroundings on a unique private 144 acre estate, visitors to Mile End Glamping enjoy views over one of the most beautiful areas in the region.